So you’re back for more? I hope by now you’ve had a chance to read Discovery in the Woods and just as I suspected, you want to hear about some of the other adventures I had with my leprechaun friend, Mr. McAllister. That’s exactly why I wrote Room for One More; we’ve had so many happy times over the years, I just had to share them. Although it’s probably more fun to start at the beginning of the Leprechaun Adventure Series, it’s not absolutely necessary. You’ll be able to enjoy any of the four books! I’m so thrilled to introduce Mark Leiser to you. I met Mark at a book fair, saw some of his drawings, and knew instantly that he was the one to illustrate Room for One More. He’s a VERY talented artist! You’ll see what I mean when you open the book and see his incredibly detailed drawings. Look carefully at each one – there’s so much to discover in his work. After meeting Mr. McAllister and earning his trust over the years, our family was growing, our jobs were changing, and we eventually had to move again – to the city. Such an environment is not terribly great for a village of leprechauns, so we had some pretty serious things to discuss. You’ll have to read the book to see what problems we had and how we solved them, but I can tell you that everything worked out just fine. You will notice as you read my books, that they share a common message – friendship and the importance of being loyal and kind. I have been lucky to find many loyal and kind friends in my life; Mr. McAllister was one of the kindest (and funniest)! That’s why it was a BIG problem for me when I had to tell him we were moving again. Who would help him? Who would be there if he needed something really important? 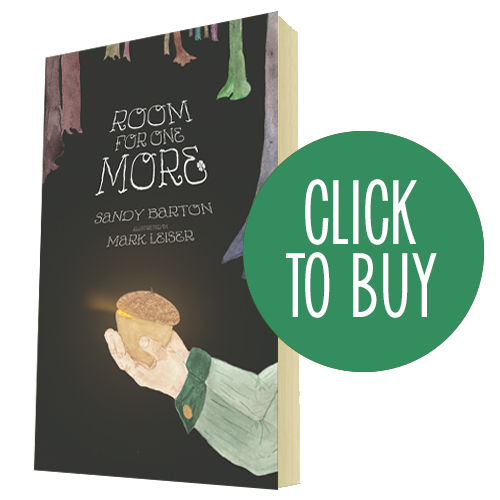 Room for One More tells about how we worked through that challenge … well, that and a few other crazy things happened! Once again, the places and adventures were honest and truly real. Miss Gloria was really my beloved neighbor, and the careless boy on the creek was a real boy. Our new (old) house was a happy home, and the new woods, the creek and the park were the settings for many, many wild adventures. Can you believe how lucky I was to have a leprechaun for a friend? Lots of kids have asked me how to catch a leprechaun so they can have one for a friend, too. Let me tell you – don’t even try. First of all, there are many kinds of leprechauns, just like there are many different kinds of people. There are leprechauns who play tricks on people and it’s best to leave them alone. Nobody needs a nasty leprechaun around. The nice leprechauns do silly things, but they don’t like getting caught – and besides, they just use their magic to escape. But, keep your eyes open when you walk in the woods. Some people will think you’re a little kooky, but the wee folk are there. You just have to look for hidden places, and you have to believe.